How can school district save so much money? COLUMBIA, Mo 3/16/2016 (Beat Byte) -- Columbia Public School Superintendent Peter Stiepleman, Ph.D. was mistaken when he told a gathering of Democrats that of $100 million in district cash holdings, "$70 million is restricted for bond repayments." The cash figure, in several savings accounts, is much higher -- $163.8 million -- and the bond repayment amount about 30% lower: $45.5 million. If this publication's experience accessing these figures is any guide, Stiepleman deserves forigiveness for the error. The savings accounts -- and which banks hold the deposits -- were inaccessible at the district's website, a problem about which Quinley and Stiepleman were unaware until our inquiries. Instead of downloading a PDF document, the link delivered nothing more than a one-page ad for an outdated version of Adobe software. School savings -- and where the district keeps it -- should be of interest to every Columbia resident, as the city prepares to vote for or against the 8th property tax increase in as many years. 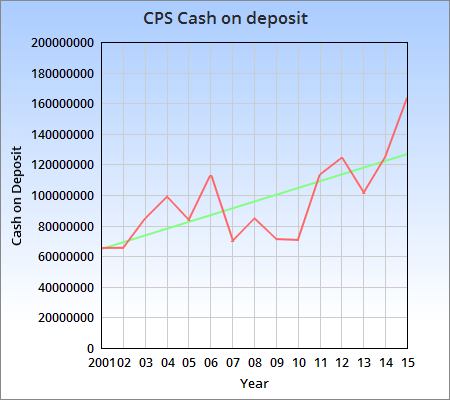 Because CPS savings accounts are up more than 250% since 2001 (chart), arguments that tax increases are the only way to meet costs don't add up. If that were true, money in savings would decrease or stay the same. Instead, the amount saved in CDs and other liquid investments keeps rising. Of the $133.4 million on deposit in local banks, "$17.7 million is for repayment of principal and interest," CPS Chief Financial Officer Linda Quinley told the Heart Beat, during an email interview that began in January and wrapped early this month. The district has another $27.6 million in a bond repayment escrow account with "a fiscal agent," Quinely added. Insurance-related savings accounts held another $7.8 million. Public officials like to tell voters that liabilities -- outstanding bills, accounts payable, and the like -- put enormous pressure on savings accounts, often outweighing them. "We have a lot of money saved," they say, "but we also have a lot of bills and payroll and such." Adding up the savings accounts and subtracting the unpaid bills from leaves $163.8 million -- and the largest property tax increase in a generation this April. You are here: Home CPS THE $164,000,000 QUESTION: As CPS savings accounts soar, is huge tax hike necessary?